12 noon - Before physical challenges took the center stage of my life, I hardly spent any time out on the balcony. I think of the balcony sooooo differently now! Balcony has become my refuge. The little waterfall now runs beautifully. Several weeks ago, when I took the waterfall apart, the reason that the fall only dribbled came clear. Now, the fall does not dribble anymore. It runs! And the sound of the water splashing into the pool is gorgeous to the ear. This restaurant is one of my favorite places to eat! Their entrees are very good. But it is their salad bar that tips the scale for me. I ordered the "1/2 dozen fried shrimp" which for a senior, includes "1-trip to the salad bar", the "free drink bar", "soup bar" and "Mexican food bar". My favorite thing at the Mexican Food bar is fried chicken wings and legs. Oh yes, I almost forgot to mention, "the dessert bar!" All of this for $8.99 ! When I returned to Guava Gardens, I decided to stay at the pool for awhile. Usually, I go directly up to my apartment. This afternoon is so gorgeous, that I am unable to resist the pool area. It's 79℉. The sky is sooooo blue. Not one cloud. I am the only tenant at the pool area. I don't know why that is so. But it is. This means that I have a private pool and spa all to myself. I am sooooo lucky. It's a beautiful one, too! So pretty. Why not put a couple of patio tomato plants, green onions, bell pepper, and some herbs out there as well and use them in your cooking? What you don't use, give to your lady friends and maybe they'll ask you over for a home cooked meal. Take care, George. Although the balcony is mostly in the shade, I might be successful with the vegetables you named. I've got two "grow lights" out there that may provide enough sunshine! Hi George, lots of greens grow well in the shade. Lettuces, spinach, kale, chard, etc. Can't hurt to try! I am trying to visualize the cot. Maybe a picture???? Please take a look at my June 9th Blog Post titled, "Buying with cash". There Is a pic of me sitting on my cot. Hi, George. I am wondering if there is a way for you to extend that balcony out a few feet? Seems like you need more garden space. Oh. Another idea. A hammock to hang from the ceiling so you can put plants on the cot. I am teasing you. You are doing a good job with your garden. Same old Dear George from the Santa Rosalia days. I remember your enjoyment of gardening then. You always find the pluses. Be aware that you are a plus for me!!! It's not the end yet George. The doc will figure something out and get you back to new. Just take it easy until you get it all figured out. Coincidentally, my neurologist phoned just this morning to report that the four special blood that she ordered came back negative. This is good news for me. It means that no rare blood disease caused my symptoms. It also means that my diagnosis remains unknown! In the meantime, every day is different. Today, for example, I have no stability problems. However, today my right hand and arm are twitching around. Hi, George. I put my comment in the wrong place. Can you please read it where it is? I don't know how to move it. It is under David Reed. Thanks. I read it. And now I am wondering if you camped near me in Santa Rosalia? 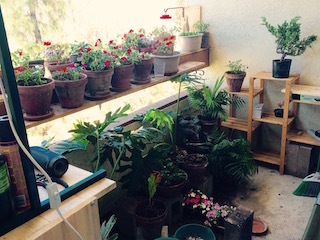 I am planning a little project that will provide more room for potted plants. I cannot extend outward from the balcony. The apartment owner doesn't want tenants doing that. My project will give another shelf the full length of the balcony. This shelf will extend inward. We should call you George of the Jungle with your fab garden! Swimming is good, easy exercise for your arthritic hip. It's easy with a pool right there.Ask your Dr. Thank you sooooo much for your swimming suggestion to benefit my arthritic hip. Garden looks great George. Glad you seem happy! Been 13 years now I've been following you. And we certainly much younger! You were one of my first blog readers! It has been a good trip, together.